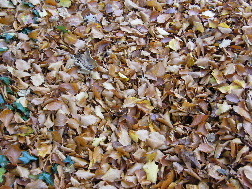 Autumn can be a time of disturbed Vata as we lose the warmth of summer to the cold of winter whilst still retaining the dryness of the late summer. Dryness and cold are two of the enemies of this Dosha along with the strengthening autumn winds. What can we do to stabilize the Vata constitution at this time? First it helps to avoid cold and dryness both in our diet and environment. Cold and astringent food and drinks should be kept to a minimum. Pungent, Bitter and Astringent tastes are those that are not beneficial because they dry the system and intensify emotional instability, especially feelings of insecurity. Also excess of any taste will aggravate Vata. In autumn cooked food is essential for Vata. Dr. Robert Svoboda in his book “Prakruti” says that Vata people are the only ones that truly need the complete protein which animal flesh provides, although over indulgence will quickly weaken the sensitive Vata digestion. The long term use of animal protein, especially red meat, will always increase Vata because the residue of protein digestion adds to the body’s nitrogenous waste burden, leading to gas and bloating. This will not help Vata’s tendency towards constipation. Remember that Vata is said to be that which moves things and is the motivating force behind Pitta and Kapha, so when high it can create problems for them too. Autumn is the time when Pitta is decreasing after the summer high and Kapha is beginning to show signs of increasing as winter approaches. Although we need to look towards the Vata constitution as autumn deepens, there will always be subtle effects in the other two Doshas during the changing of the seasons. Remember that no one is totally one Dosha, we are all tri-dosha and although personally I am strongly Kapha and my weakest Dosha is Vata I can still be affected by an imbalance in this Dosha, especially at this time of year. Stay in the light of your balanced Doshas.